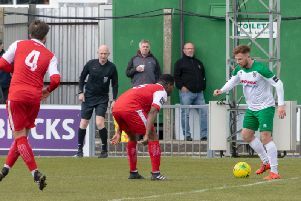 Tommy Block lifted the lid on his dream switch to Scottish Premiership Hibernian from Bostik Premier Division Bognor Regis Town - and then saw boss Neil Lennon facing the exit door at Easter Road. Former Rocks midfielder Block, 19, officially made the move to Edinburgh two weeks ago and has already made the subs' bench for the first team for a Scottish Cup victory over Elgin City. And he was in the 21-man squad that lost at Motherwell in the league but didn’t make the cut when the number was whittled down to 18. Former Brighton youngster Block has been thrust straight into the first team squad but since he arrived he has had to contend with the shock suspension of head coach Lennon. The former Celtic boss look unlikely to take charge of Hibs again after an exchange between the Northern Irishman and employees of the club on Friday. Head of academy coaching Eddie May and assistant coach Grant Murray were at the helm against St Mirren on Sunday. Speaking before Lennon was suspended, Block revealed: "I really am living the dream here and it wouldn't be possible without the fantastic welcome I have had from all of the staff, my team-mates, the gaffer and the fans, who have been different class to be fair. "When I warmed up from the bench against Elgin City it seemed like the entire stadium was applauding, it was an unbelievable moment for me and a little overwhelming if I am honest. "I was in the 21-man squad for the Motherwell game but didn't make the actual 18-man squad but prepared for the game; in the hotel beforehand and on the team bus and watched the game in the stands. 'To be involved with the first-team have given me a taste of what I can achieve with hard work and I have set myself personal goals in training and in terms of fitness, preparation and positive attitude. "All the lads are so welcoming and as for the gaffer (Neil Lennon) -- how can you not learn from a manager of his standing and the pedigree of his playing career? "My fitness had always been pretty good but it was good for a non-league level and the level of fitness as a professional is a lot higher. Here we are training almost every day and I am benefiting from the schedule and the experience being handed to me from the gaffer, the coaches and my team-mates.